We are taking names of those interested. Now to be bred and available in New Jersey, USA. At no time has this line been bred in USDA published Africanized states. Time in Ontario has shown the Buckfast to be extermly winter hardy, in addition to hygenic and gentile. Long Term Plan: Our goal is to join the Karl Kehrle Foundation , NL once our production of queens goes into action. At that point we will look to be listed as one of their Buckfast Breeders on their list of breeders. The qualities and characteristics desired in Brother Adam's breeding can be divided into three groups; Primary, Subsidiary, and 3rd, those that have bearing on management. Foraging zeal - a boundless capacity for foraging work, close inbreeding to intensify this quality can be counter-productive. Brother Adam came to beekeeping during a UK tracheal mite crises. 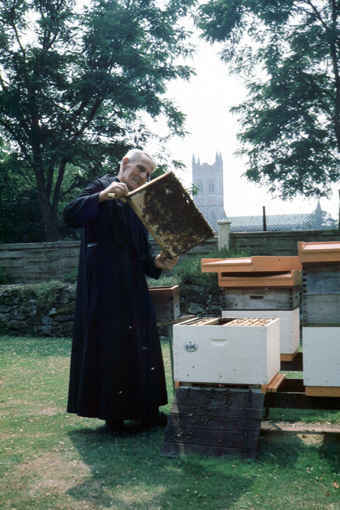 Due to his early experiences the Benedictine monk Brother Adam came to look at abilities of different of different honeybee races. Every strain and race was looked upon as a possible genetic resource. Brother Adam established a special mating station in an isolated area of Dartmoor, a desolate area with little vegetation, few bees and a hard climate. Dartmoor was made famous during story of Sherlock Holmes - The Hound of the Baskervilles. He also used instrumental insemination to a certain degree. But the mating station on Dartmoor has always been the corner stone in his breeding. Brother Adam stated if you don't aim at fast progress, but just want to preserve or make a slow progress, making a mating apiary with your best colonies regardless of their genetic relationship is a good way, according to my own opinion. But when you cross different strains that are quite different genetically, you will in the next following generations get a quite wide variation, so you need a narrowing of the genetic upset of the drone side to make progress with a reasonable speed. Watch the bees carefully. Maybe they are telling you that you are doing the right thing. Maybe they tell you that you are working after the right theories. Maybe they will give you good colonies and you don't understand why these odd colonies are that good. Be humble enough to admit that it is a possibility that you don't know everything and take care of such colonies. And let the bees tell you afterwards what you have got. Brother Adam always advised you: Let the bees tell you. Today the Buckfast bee from Buckfast Abbey contains heritage from mainly A.m. ligurica (North Italian), A.m. mellifera (English), A.m. mellifera (French), A.m. anatolica (Turkish) and A.m. cecropia (Greek). The Buckfast bee of today also contain heritage from two African rare African stocks A.m. sahariensis and the A.m. monticola, but not A.m. Scutellata. 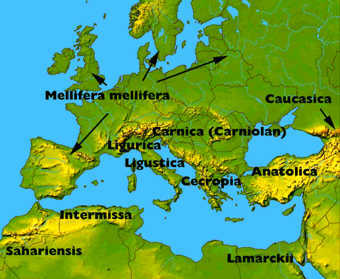 Important races, which are included in the Buckfast strain, are Mellifera from England and France, Ligurica (Ligustica) from Northern Italy, Cecropia from Greece and Anatolica from Turkey. The honeybee races in Africa are at least as differing from each other as the European races are between themselves. African honeybees are not only Scutellata (the Africanized bee), but also the interesting and promising Monticola from the East African mountains. Brother Adam made many journeys, especially around the Mediterranean, to find different races and strains to try out. 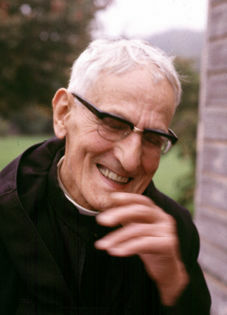 One of his last journeys was to Tanzania in Africa to find the black mountain bee in East Africa. And one of his last statements was that the African continent is a genetic treasury. 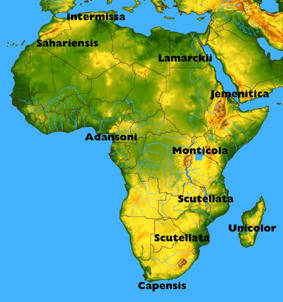 What could be surprising is that there are other bees of another extreme relatively close to A.m. scutellata in Africa. Above the mountain rain forests on the mountain slopes in East Africa you have a bee with a relatively very low swarming tendency. That bee is A.m. monticola. Actually, when merged into the Buckfast bee, you get an extremely low swarming bee, that given ample room for egg laying, food storage and for the bees themselves; they don't need any regular swarm control. A new queen may even get along with the old queen without a swarming event. But is that going too far concerning low swarming tendency? On some of the mountains A.m. Monticola is black, on other they are more brownish-red in color. (Mt. Elon vs Mt. Kenya) But they are usually bigger in size than Scutellata and much easier to handle. They have less hair and often black hair, especially on the thorax. On Mt. Elon it has been observed that bees are larger as the elevation increases. Who knows what other interesting bees may be found on this huge continent? A brief account of beekeeping at the abey. Our Buckfast line comes from Bill Ferguson in Ontario, Canada. They are not related to other USA domestic Buckfast. Some domestic queen breeders refer to one of their genetic lines as Buckfast. Some of them open mate their queens in areas that the USDA has found Africanized (A.m. Scutellata). Others have imported drone sperm and used it on their local virgin queens. This may change the characteristics of their local line, but how true they are to the Buckfast is hard to say. Genetics have a funny way sometimes. Improvement is also not something that comes over night or in the insemination of one virgin queen. The Ferguson stock has been through the very cold Ontario winters, and has been hygienic tested for the last 20 years. The stock was brought directly from the Dartmore isolated mating yard (UK) around 1990, and is now Ontario raised. During 1998 Erik of Elgon Bees made a trip to the Kenya mountains of East Africa. Genetics were harvested from Mt. Elgon and brought back to Sweeden. Between 2007 - 2009 Bill Ferguson incorporated genetic material from Erik's bees adding more diversity to the genetic pool.